"Does anyone still wear ... a hat?" Yes. Yes, they do [see right]. Ladies and Gents, it's time for us to tip our hats to wish Elaine Stritch a very Happy Birthday for on this day in 1925, the legend was born. Indeed, that would make her 87. 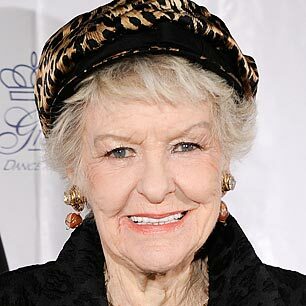 Elaine Bawson Stritch was born in Detroit, Michigan to Mildred, a homemaker, and George Joseph Stritch, an executive with B.F. Goodrich. Her family was wealthy and devoutly Roman Catholic. Stritch was a niece of Samuel Cardinal Stritch, the former Roman Catholic Archbishop of Chicago. I'd give you the run down of her career, but that would just be preaching to the choir, right? We all know this legend has been working her hysterical timing and brassy voice on stage, on film and on television since her stage debut in 1944 - some 68 years. And she's still going. Bless her heart. Stritchy, here's to the Lady still lunching! Happy Birthday!